Bryston BCD-3 review | What Hi-Fi? Why buy a dedicated CD player like the Bryston BCD-3? It’s a fair question in this age of streaming and file downloads. The answer is surprisingly simple. It’s good. If you have a large collection of discs and don’t have the inclination to move to computer-based audio, this Bryston CD player could be what you need. It will come as no surprise to anyone that follows this Canadian brand that the BCD-3 is a purist affair. It’s a plain, understated box that at a glance could pass for a budget machine. That impression fades when you see the unit in the metal and notice the thick aluminium front panel and general solidity of build – this is clearly a premium product with a quality of build that matches the price. It’s available in a black or silver finish. Bryston’s reputation is built on tough professional gear – things that are designed to work year in and out while taking plenty of abuse – and that ruggedness has been carried over into every product we’ve tested from the brand. The BCD-3 is no different. Inside you’ll find a digital design that borrows heavily from the company’s well-regarded BDA-3 digital-to-analogue converter using dual balanced AKM 4490 32-bit/384kHz DAC chips. Great care has been taken to reduce jitter and minimise distortion. The analogue output stage is a Class A design using the company’s own discrete op amps. The analogue and digital sections have their own power supplies to minimise any interaction that, potentially at least, could spoil the sound. There’s no doubt that Bryston has worked hard on this product. But what does throw us a bit is just how far the company has stripped back the package. 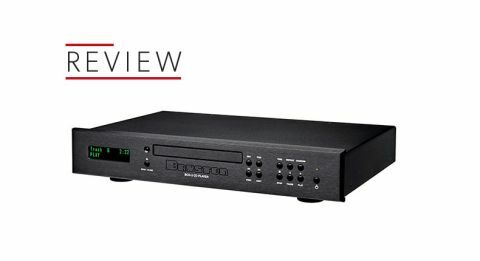 There are no digital inputs, which have become something of a standard feature in most recently introduced CD players. Digital inputs are a good way of keeping the player relevant even if the owner decides to move to computer audio. After all, CD players have a DAC circuit built-in, so why not make it accessible to other digital sources too, particularly as a high-end product like the BCD-3 is likely to have considerably better conversion circuitry than most of those sources? The idea makes sense, but Bryston also feels that it could compromise CD performance due to having to accommodate a wider range of input signals and sampling rates. The company has been a little tight-fisted by not including a remote handset as standard. Come on Bryston that’s just mean – even budget players at a tenth of this price have remotes. You can buy a rather fetching all-metal BR-2 system handset from the company for (take a deep breath) £400, or use a dedicated custom install controller. That apart, everything here is pretty standard. There are both single-ended and balanced analogue outputs, as well as coax and AES/EBU digital outs. Don’t get too excited by the presence of an ethernet socket. Bryston hasn’t hidden away a streamer module in the BCD-3’s slim chassis. The connection is there for firmware upgrades alongside a USB and a trigger input for system integration. Lack of remote apart, there’s little out of the ordinary here when it comes to usability. The front panel controls feel positive and a nicely laid out. The display isn’t particularly big but remains clear enough to see from the other side of the room, and the drawer glides rather than stutters as it moves. Our review sample has already been properly run-in by the importer, so there is little else to do than plug it in, use a decent support and leave it on repeat for a couple of hours. We use our regular reference system of Gamut D3i/D200i pre/power and ATC SCM50 speakers. Those expecting sonic fireworks are in for a disappointment. The BCD-3, like most Bryston products, just doesn’t swing that way. It’s balanced, mostly neutral and detailed, and avoids the temptation to hype the recording in any way. Play George Michael’s Fast Love and this player is right at home. The BCD-3 sounds cohesive and organised, managing to tie the song’s numerous instrumental strands into a convincing whole. Michael’s vocals are communicated with solidity and natural warmth – the Bryston avoiding the overly etched and slightly lean quality many higher end players use to emphasise detail. This sounds more natural, if less overtly impressive. We like the way the player handles nuances and the way it shades small-scale dynamic shifts. Rhythmically it’s surefooted. There’s not quite the sense of momentum we hear in players like Roksan’s cheaper Caspian M2 or Naim’s pricier CDX2, so there’s an element of excitement lost, but there’s still enough to keep us interested. Moving onto an old favourite in the form of Hans Zimmer’s Gladiator OST allows the Bryston to show off its control and organisation. Battle is one of the most demanding tracks we know with its combination of savage dynamics and complex orchestration; the BCD-3 copes well. It’s insightful, delivering a good amount of information and arranging it in a musical manner. We’re rarely distracted by what the player does, which leaves the music in the spotlight. The player’s tonality is nicely judged too, treading the balance between weight and agility well. Stereo imaging is precise and reasonably spacious but lacks a little scale. The low-end isn’t flawless either. It’s precise, extended and nicely textured, but sounds a little polite. While the mid and higher frequencies have a good amount of bite when the music demands the bass frequencies seem a touch reserved. It means the drama of this piece is diluted a touch. Make no mistake the BCD-3 is a fine CD player. It is certainly worth a place on the shortlist if you’re after a higher-end CD player. Its well-balanced nature means it will slot into a wide range of system with ease and in the best possible way fade into the background. That’s the mark of a good piece of hi-fi.